Back in February, Katy and I gave the paleo diet a whirl in an effort to get in shape for a Mexican beach vacation. If you are unfamiliar, it is a diet based on the ways of our caveman ancestors. Lots of meat, vegetables, fruits, and nuts. No dairy or grains and absolutely no processed food. To be honest, we each did our own modified variation of the diet, taking some liberties with what was acceptable and what wasn’t. I allowed beans, rice and quinoa, and yogurt. I figured those are all healthy foods, and it helped keep me sane. I really felt great during the diet and I’m continuing to avoid processed food like white flour, refined sugar, and processed meat. Anyway, I made this recipe up during the diet, and even though bread crumbs are cheating, who cares right? It’s a 1/4 cup! It makes enough for 2 people plus a little leftovers, so scale up if you’re serving more people. Grease a cookie sheet with butter. Use a sheet with raised edges so grease doesn’t spill off. 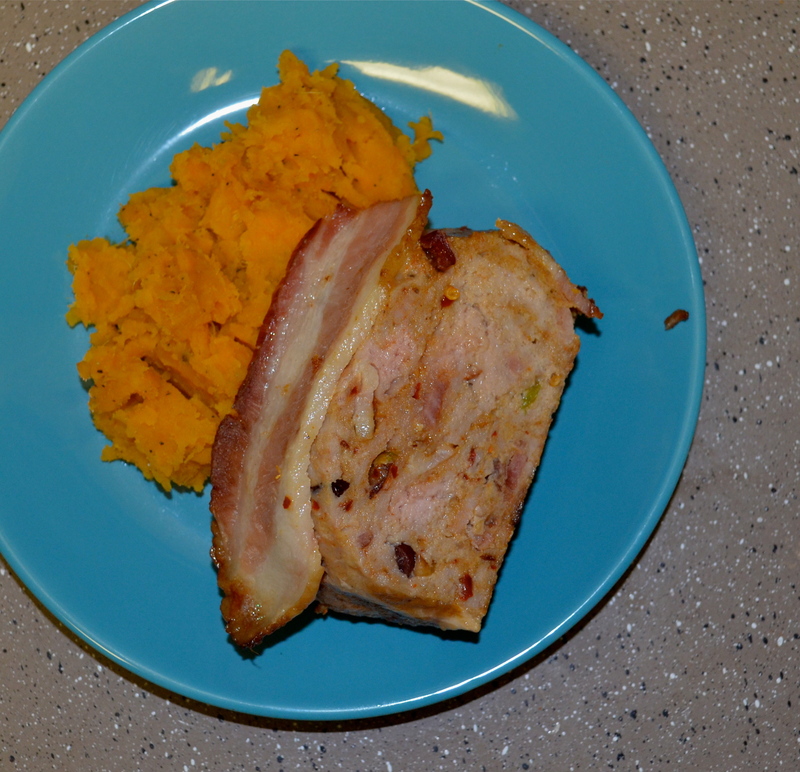 Cook the bacon on medium heat until some of the fat has rendered off and it just begins to brown. Remove from heat and drain on paper towel. While the bacon is cooling, mix everything but the turkey and egg in a large bowl. 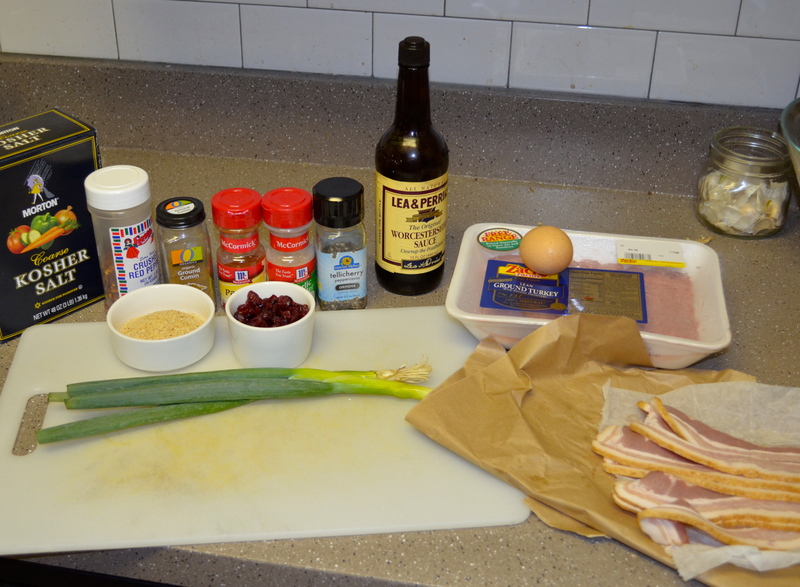 Then chop three strips of bacon into 1/4″ bits and add to ingredients. Next, add the egg and ground turkey and mix all ingredients thoroughly with your hands. Shape into a loaf and place onto the cookie sheet. 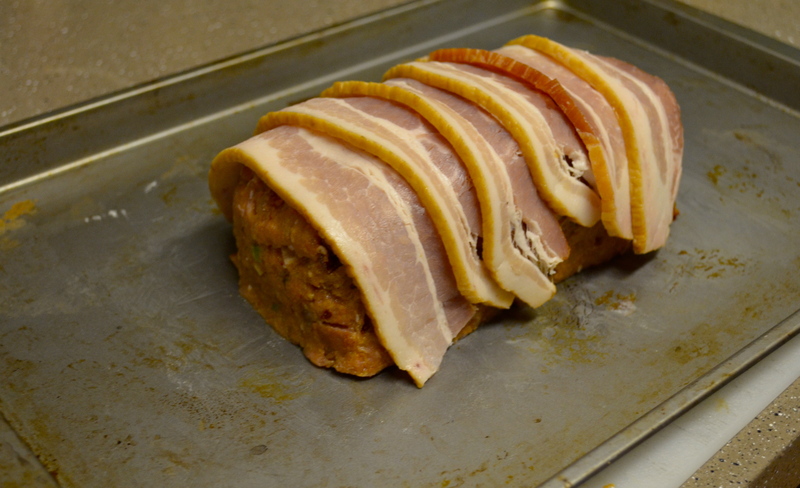 Cover with the remaining bacon strips and bake for 45 minutes. 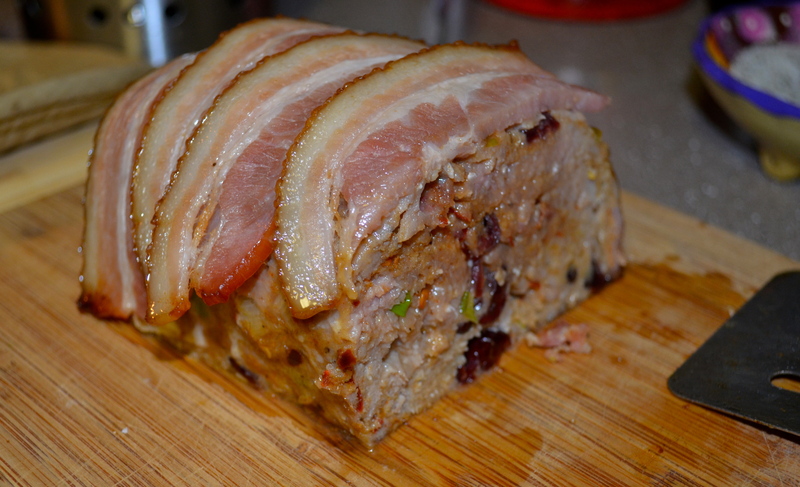 I love this recipe because the turkey stays moist, and the bacon adds awesome flavor (it always does)! Little bites with cranberry and onion add sweetness and texture, and the cumin and red pepper give it a nice little kick 😉 Have fun cooking and enjoy! Thanks for reading. I’ve fallen in love with many a food truck here in Austin. But my favorite so far has to be Kebabalicious. They serve Turkish-style wraps and operate out of two trucks permanently stationed (for the most part) downtown — one at Congress and 2nd (for lunch during business hours), the other at Trinity and 7th (for the late-night drunk crowd). Fortunately, I fall under both categories and I’ve tried both locations. The product and service is exceptional and consistent at both. 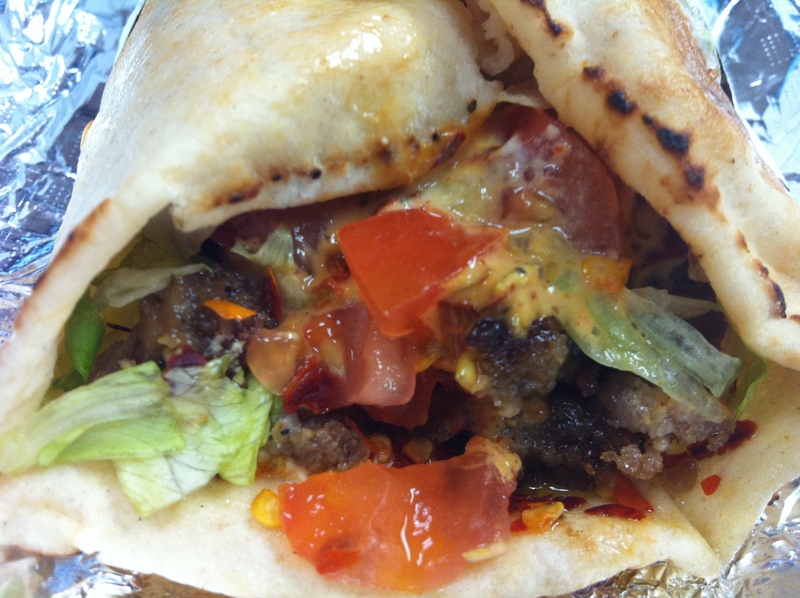 Kebabalicious is family-owned, locally sourced, and run with real passion. The wraps are made for you on the spot and truly have thought put into them. Each bite contains a bit of every ingredient. I almost always order the same thing — the king-sized (12″) beef/lamb kebab. I go for the regular size (8″) when I’m lunching, but at night after a few beers, even when Kyle responsibly orders the regular size (and the lady serving us mistakenly assumes the larger one is for him), I need as much Kebabalicious as I can get. If I can’t finish it that night, into the fridge it goes until I open my eyes the next morning and crawl to the fridge to finish it at 10 AM. Not even kidding, it is THAT addicting. The sandwich is wrapped in a perfect, squishy pita bread. It’s just thick enough to hold its contents without overtaking you with breadiness. It doesn’t crack when it bends, it’s warm, soft, and supple. 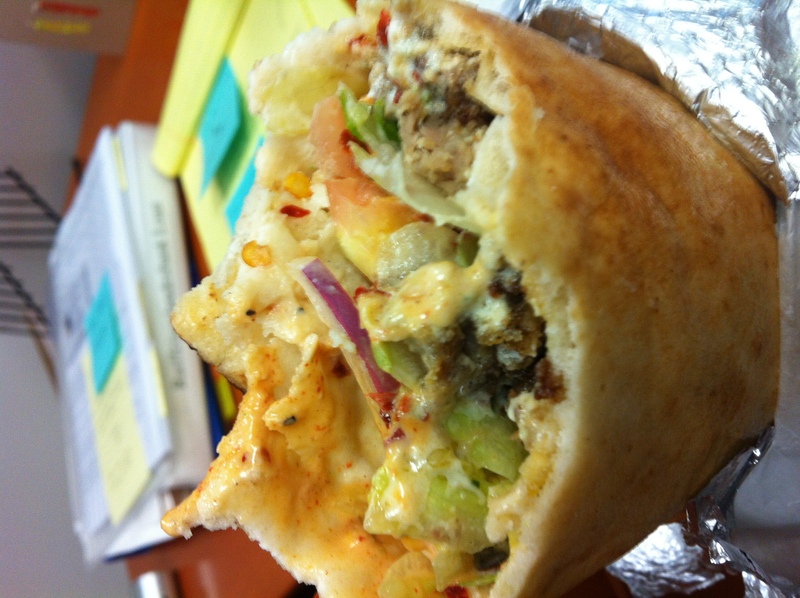 The beef/lamb shawarma appears/tastes to be mixed with falafel or some type of grain. It’s formed into nuggets that are likely heated through on a griddle — amazingly seasoned, savory, and well-textured succulent meat, no icky bits. Each nugget is slightly charred and crunchy on the outside and warm and soft on the inside. Tons of flavor and enjoyable on their own, they melt in your mouth. Next are the veggies…lettuce, locally grown tomato, red onion, and fresh parsley. Unlike other shawarma wraps I’ve had, the veggies are consistently fresh and perfect every time. No haphazardly chopped pieces, no off-tasting onion, just light, crunchy, ripened bites that perfectly complement the heaviness of the bread and meat. They make these wraps mild, medium, or spicy (adjusted by how much crushed red pepper they shake on). Spicy is best — nowhere near unbearable or even overpowering, just another note to cut the richness. I also have them add feta to mine. Not necessary but a perfect extra indulgence. Amazing. Last, but not at all least: the sauces. The wraps come with two sauces on them, both of which are incredible and balance each other out perfectly. One is a tzatziki (strained yogurt, cucumber, garlic, olive oil, lemon, dill, often other spices), both creamy and herby, but not too tangy. Each component of the wrap is seasoned very well and this sauce is no exception. The coolness of the sauce also brings the heat level down a notch. And finally, the spicy red sauce. I would pay serious, serious dough to get just a glimpse of this recipe. It’s also creamy but slightly heavier than the tzatziki, coral red in color, and appears to be almost a spicy or red pepper aioli. Phenomenal and adds the perfect amount of richness and a tad of garlicky flavor. I remember Bobby Flay saying on TV once that the most common problem he notices in sandwiches is that they aren’t sauced enough and are therefore too dry on the mouth. The Kebabalicious sauces solve that problem all too well and provide the perfect vehicle to marry all of the ingredients together into one phenomenal experience. The combination of these perfectly orchestrated ingredients create a heavenly, constantly crave-able meal. I really can’t say enough about how much I would recommend this to anyone who ever has the opportunity to try it. I also do not ever want to know how many calories are in one of these things. Another thing to note is that I love how Kebabalicious brings to the masses what could be intimidating to some in such a great way. What better way to try out a cuisine that isn’t as familiar to Americans as Italian or Chinese than something this incredible? Other options for the wraps are chicken shawarma, falafel, and the “spoiled brat” (chicken, beef, lamb, falafel, and hummus!) and run at about $7 for a regular, $9 for a king size. The chicken and falafel are exceptional, though I can’t speak for the spoiled brat as I haven’t graduated to that level (yet). 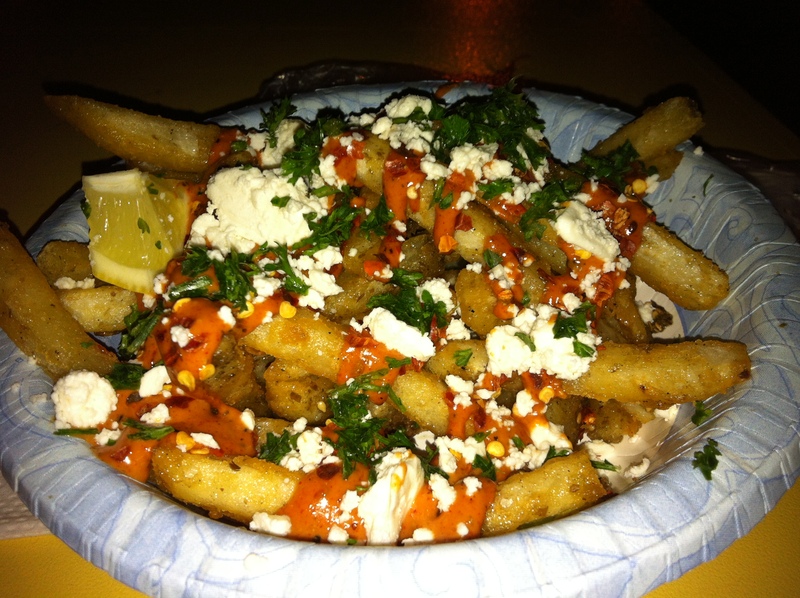 Finally, and this I can’t stress enough: if you have the good fortune to try Kebabalicious, try the loaded french fries. Words simply don’t exist to describe them. The fries alone are hot, fresh out of the fryer, perfectly crispy, and would be amazing all by themselves. But, they’re taken to the next level with tons of parsley, spicy red sauce, and feta. Tasting these fries for the first time was the biggest food-high I’ve had in a long time. In closing, thanks for reading and please share your Kebabalicious-related experiences here. 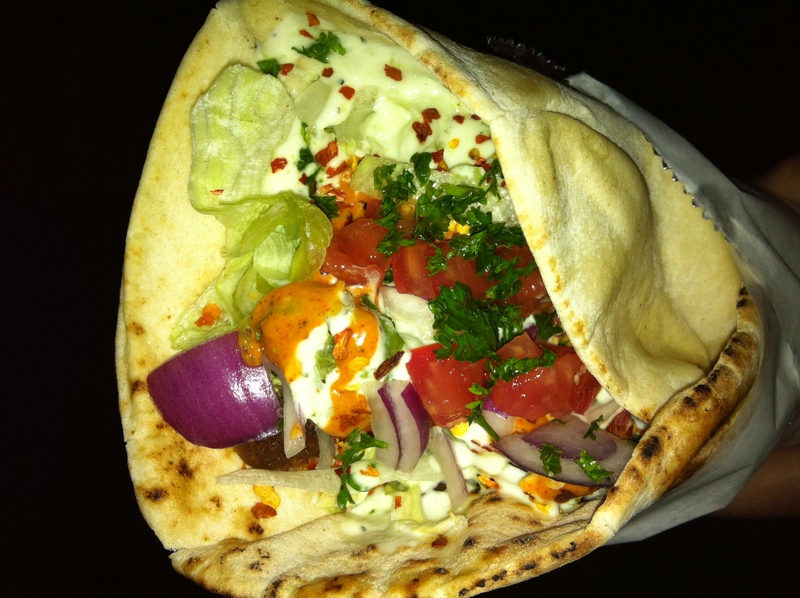 Kebabalicious has about 200 reviews and has earned itself an average of 4.5 stars on Yelp. That’s very impressive, but my rating is a solid 5 out of 5.